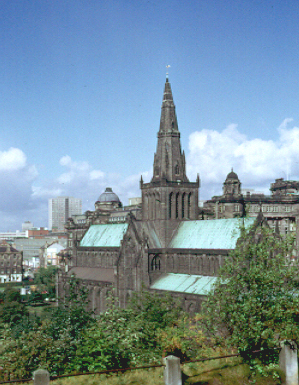 The Gneral Assembly of the Church of Scotland, held in Glasgow on 22 November 1638 was one of the most important and significant events in the early years of the Covenant. No bishops were in attendance and many lay Covenanters attended, bearing arms. A letter of protestation from the absent bishops was attempted to be read, but it was ignored. Rev Alexander Henderson was elected as Moderator and Archibald Johnston of Wariston was appointed as Clerk. The Marquis of Hamilton claimed that the assembly was illegal, and ordered all to leave, on pain of treason. When they refused, he tried to leave himself, only to find the door locked. The assembly continued its meeting until 20 December, removing many acts that kings James and Charles had created over the previous forty years, including the Canons, Liturgy and the Five Articles of Perth. Episcopacy was abolished and the bishops excommunicated individually. Presbyterianism was restored as the church government. The Assembly is said to have been the start of the revolution, which led to the civil wars and was condemned by Charles I as a gathering of traitors.